I like to spend one day a week going over all the wine samples I’ve been sent -and during this time of year, it is a lot of samples – in the hope that some will fill me with excitement and joy – over-delivering the goods so to speak. A couple of wines from a producer that I never heard of until this time, Fattoria Petriolo, really struck me with sheer delight. The intense vitality of the couple of bottles I tried had generous, complex aromatics, delicious and intriguing flavors dancing on my palate. One was a 2013 Chianti DOCG Riserva and one a non-vintage Rosso Toscano… the wines were so impressive I immediately searched for them on wine-searcher.com. Well, they are not on the US market, as far as I can see, and yes, lo and behold, the back labels are only in Italian. Why did I allow them to send these samples to me? I was curious about them because an email was sent to me by one of the winemakers explaining how the wines were made by two young winemakers (29 and 20 years old) – their website was fun and playful and I was initially slightly curious if their wines would display the same spirit. But what really made me pull the trigger and say, “Yeah, I need to try those wines!” was the idea that they were the only Italian winery chosen, along with five others, for the INNOYEAST project. The INNOYEAST project lasted for two years (2009-2011) and was funded by the European Commission. It had such famous wineries such as Marqués de Riscal and Château La Pointe participating in it. This project helped to encourage producers, in various countries, to use the local yeasts living on their grapes in the vineyards and the walls of their winery to help their fermentations so that their wines may express a deeper meaning of sense of place. I know all of you are so excited to have this debate, but don’t worry, I will keep this short for now and go into this very wine geeky discussion, in more detail, at a later time. But I’m sure many of you know that even though the general idea of indigenous, local, autochthonous yeasts (or whatever term floats your boat) would seem like a “natural” choice, there are many issues associated with using indigenous yeasts such as the increased possibility of a stuck fermentation. When a stuck fermentation happens there is a greater chance for microbiological spoilage, which may not be dangerous to drink, but it sure can be nasty to taste. Cultured yeasts, aka inoculated yeasts, have a higher guarantee of completing fermentation decreasing the likelihood of stuck ferments. Also, different yeasts can add different aromatics and flavors, enhancing or diminishing certain qualities. Some people are afraid of GMO (genetically modified) yeasts because they think it will allow producers to make all wines taste the same. This sort of conundrum, damned if you do use indigenous yeasts, damned if you don’t, is one that is debated and argued with vigor with extreme opinions one way or the other. Personally, I am not a dogmatic kind of person – I am always trying to find balance with the force. I like to think back to my lunch with Ana Diogo-Draper, Director of Winemaking at Artesa Winery in Napa Valley, and her proclamation, “Terroir to me is a wild ferment”. She had just started experimenting with indigenous yeasts, and even though she has always been terrified, as any winemaker should be, of a stuck fermentation, her indigenous yeasts’ trials were so impressive, with incredible flavors and aromatics that she has never had before experienced, that she decided to take the risk of using indigenous yeasts (some call it a wild ferment) more and more. But she also explained that the key with this research project in the future, in which she will involve the University of California, Davis, is to find the “strong” yeasts that will avoid a stuck fermentation but add desired aromatics. This is where the INNOYEAST project was important, as they helped wineries to isolate and select yeasts that were reliable during fermentation but also expressed the inherent character of the vineyards. There are some risks not worth taking and quite frankly, some companies are able to take more risks than others due to their situation. Diogo-Draper emphasized that it would have been a real shame if she had never known the true potential of her wines. Also, it was great that this INNOYEAST project decided to take a risk on a lesser known winery, Fattoria Petriolo, because I don’t know if they could have done it on their own. 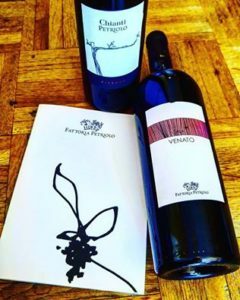 Finally, I was happy that I took a risk in accepting wines that were not widely distributed in the US market because these Fattoria Petriolo wines were very exciting – it would have been a shame if I had missed out on this special experience. -2013 Fattoria Petriolo Chianti Riserva DOCG, Tuscany, Italy: 90% Sangiovese , 5% Merlot and 5% Cabernet Sauvignon. Intense nose with aromas that grabbed me with purple flowers, mashed blackberry and wet clay that had a long, refined finish with more nuanced notes. Chewy tannins with an overall vibrancy to this wine that made my heart beat a little faster. -Fattoria Petriolo, Venato, Rosso Toscano IGT: 50% Sangiovese and 50% Cabernet Sauvignon and Merlot. This wine had more evident structure with grip on the palate, yet it was nicely balanced with ripe blueberry pie fruit and hints of some complexity with granite and earthy flavors. A bigger, more robust wine but still had a great vitality that makes it easy to drink another glass. This entry was posted in Uncategorized and tagged Chianti, Italy, Tuscany, Yeasts. Bookmark the permalink.